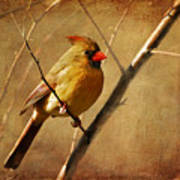 Lois, I often think that the female Cardinal is prettier than the gaudy red male. You've captured this lady perfectly. Beautiful image, Lois. Congratulations on your sale!! Congrats on your sale ,Lois, Fave!! Congrats on your sale Lois! 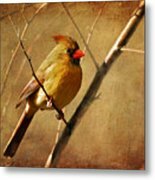 Such sweet images you create of feathered friends, Lois! 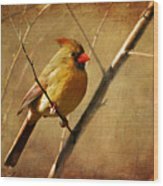 Congratulations on your sale of this lovely image, Lois! Lois, I love what you do with your all of you art! You add such warmth and nostalgia. This is Beautiful! You would even amaze J. J. Audubon if he could see your work. A very sincere thank you to Robert and David and Tyler and Carol!!! A beautiful image of my favorite bird. I am fascinated by your photography. NOTE: FINE ART AMERICA WATERMARK WILL NOT APPEAR ON PURCHASED IMAGE. 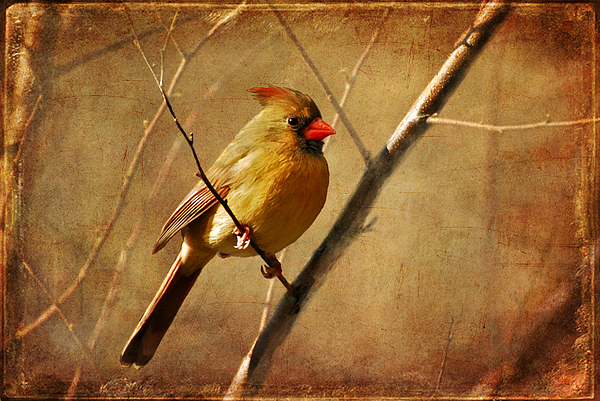 A beautiful female cardinal enjoying the late afternoon sunlight of a beautiful winter day.